While I could have spent our entire trip to Budapest in their hot spring baths, I’m glad that I had to come up out of the water long enough to eat. 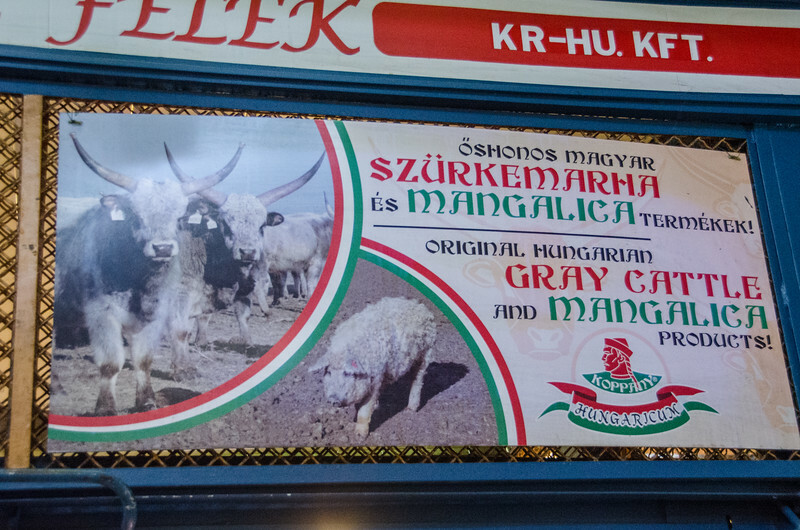 While Hungarian food is not very well known outside of the country, minus goulash (gulyás), I found there was a lot more to know and love about Hungarian cuisine. 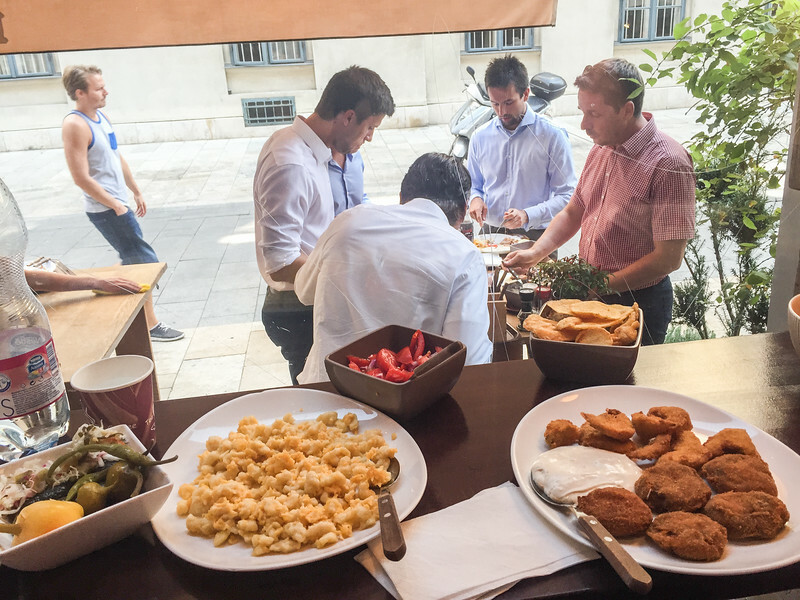 One of the best things we did on our trip was to book a culinary walking tour with Taste Hungary, a company specializing in food and wine experiences in Budapest and beyond. 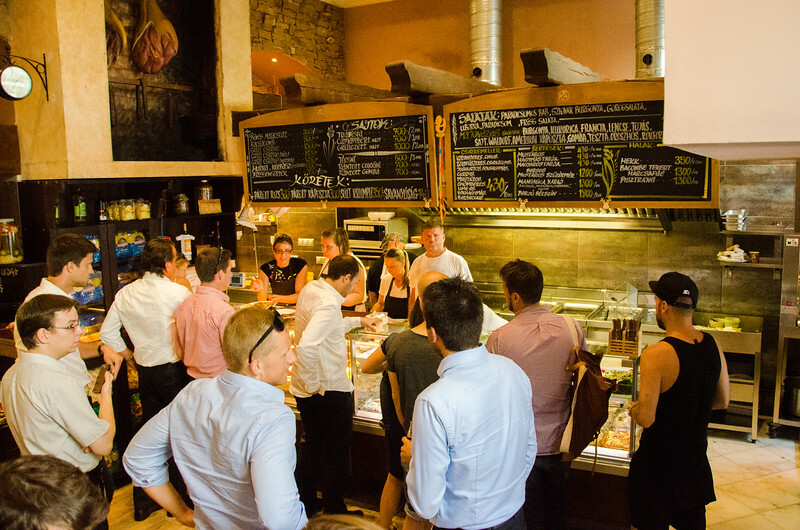 What was scheduled to be a four-hour tour, turned into five hours of eating our way around the city. 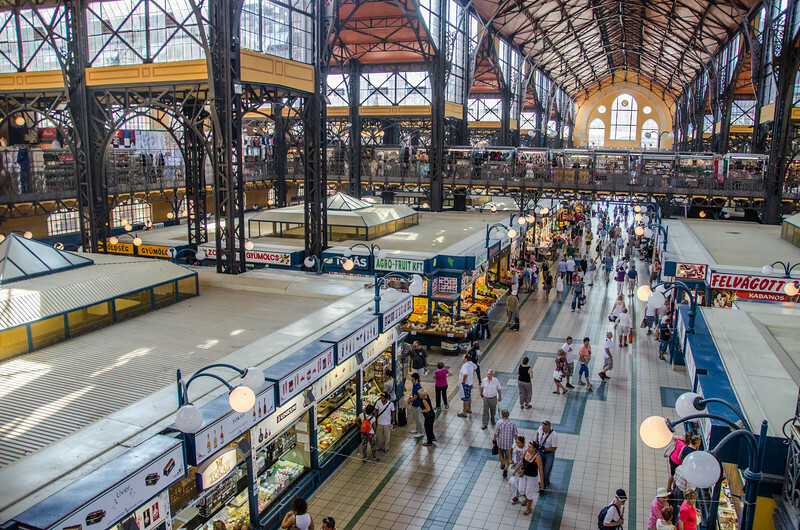 We started the morning at Budapest’s extravagant, steel-framed Great Market Hall, Hungary’s oldest and largest indoor food market. 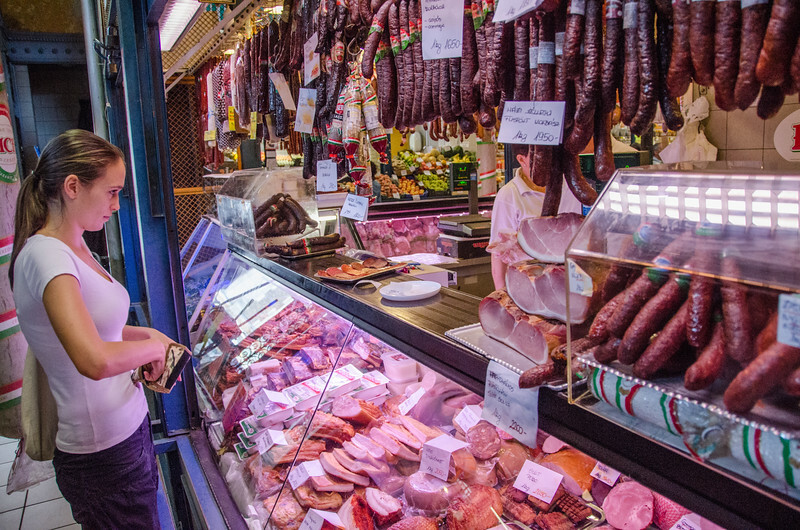 We learned about what to eat in Budapest (lamb, pork, cured meats, game meats, wild mushrooms, pickles, anything buried in paprika) and what not to eat in Budapest (“we’re not known for our steaks”). We learned about how the country’s turbulent history, including the rise and fall of Communism, affected eating habits and the domestic food market, we discovered a new favorite wine, “tokaji,” a topaz-colored Hungarian wine made from late-harvest/almost rotten grapes, and perhaps my favorite street food in the world, “lángos,” hot and dripping fried dough topped with sour cream, garlic, and cheese. We had a small group, just me, Kevin, two lovely New Yorkers, and our Budapest-born and raised guide, Julia. It was a really fun and eclectic tour, with plenty to eat — I’m not complaining, we all took doggie bags home with leftovers! 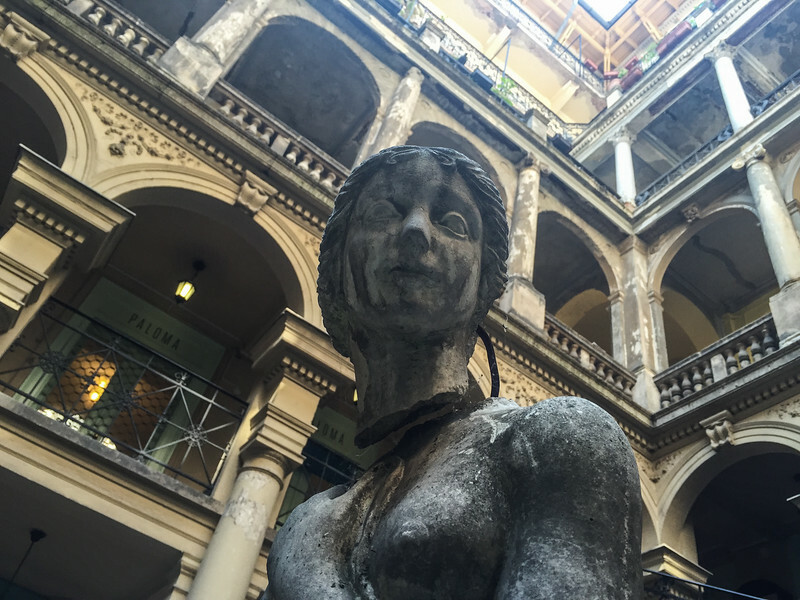 One important lesson I learned was to never do a food tour on your last day in a city. Do it at the beginning so you get a taste for what you might like and learn about other foods you’ll want to try. 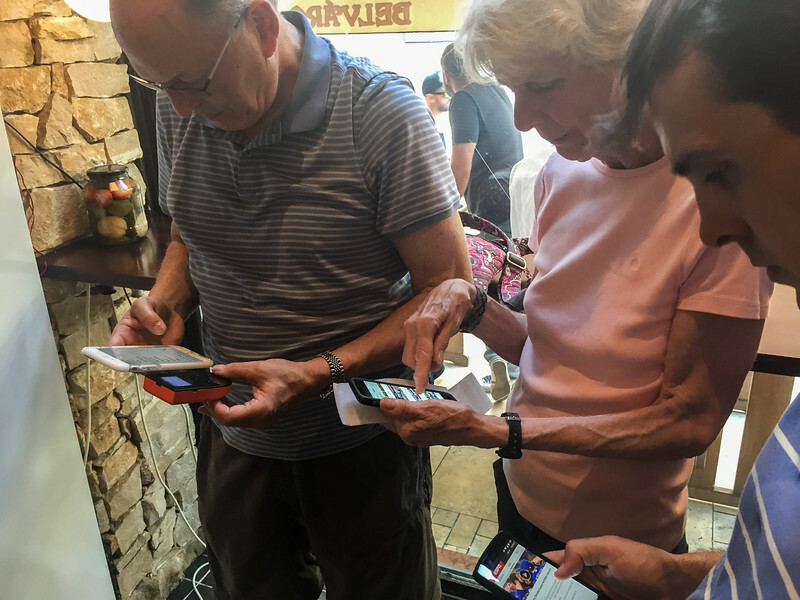 Here are some of the unique things that we ate at the market and images from the stops on the tour. 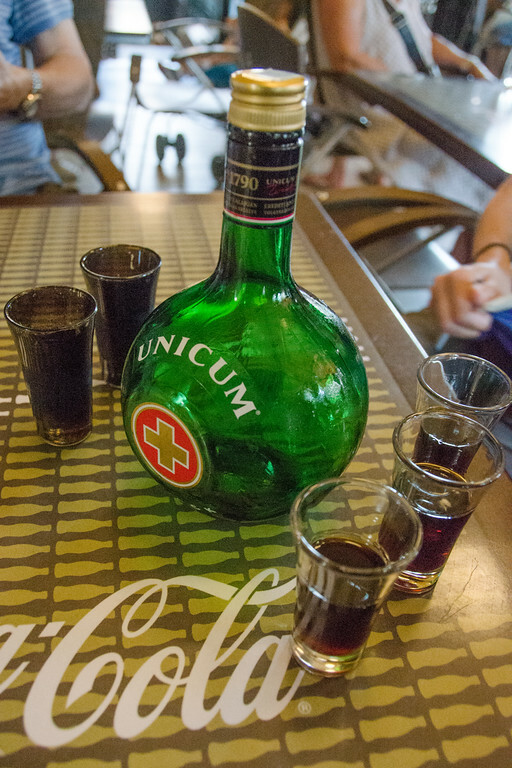 Unicum: A liquor blend of 42 herbs and spices, sometimes called Hungary’s national drink. 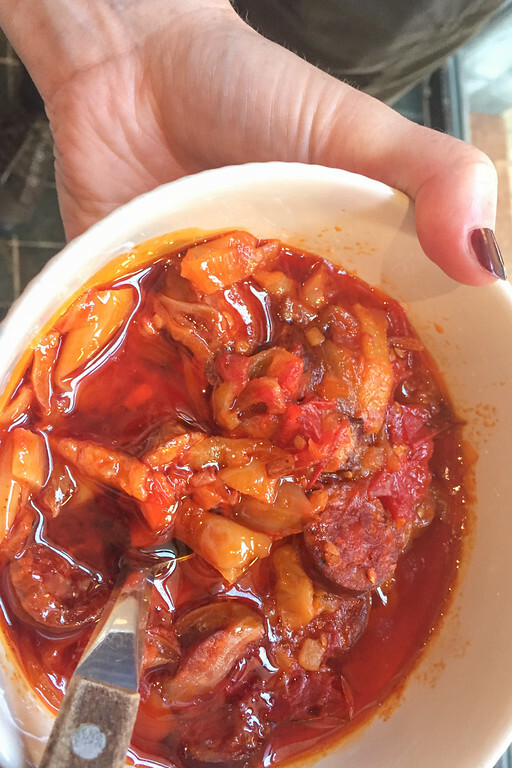 The recipe is top secret and the family that owned it fled the country during the communist years and took the recipe with them. The nationalized plant could never quite get it right. After independence, the drink returned. Locals love it, but it’s a challenge. The plum-flavored variety went down a bit easier. But this stuff definitely cleared the sinuses before beginning the tour! 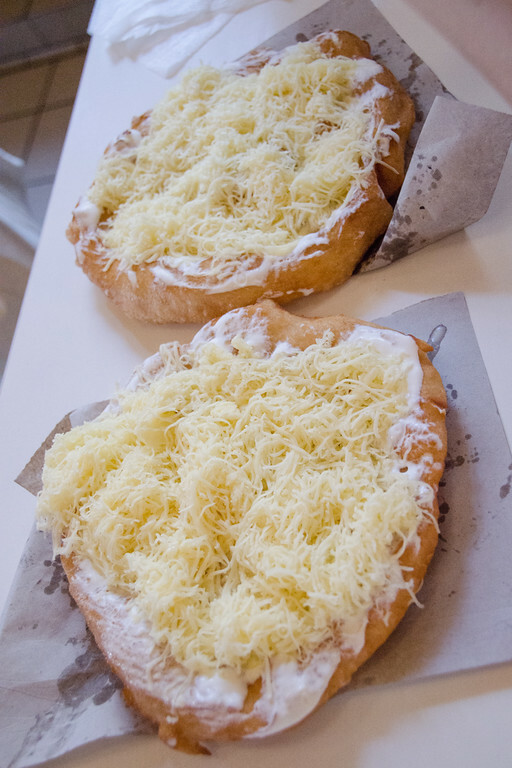 Lángos: My favorite find — decadent and fatty, deep-fried dough covered with sour cream, cheese, and garlic. This was the one discovery that made me regret booking the tour for our last day in town, had we started with the tour, I would have eaten langos every single day. 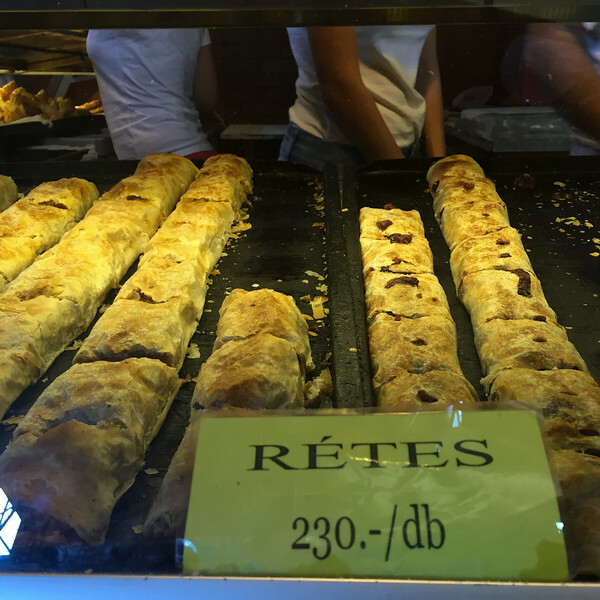 Rétes: A sweet, fruit strudel dessert in several flavors, the sweet cheese and cherry-poppy seed were our group’s favorite flavors. Pickles: I’m a bit of a pickle addict, so seeing rows and rows of pickle vendors had me very excited. 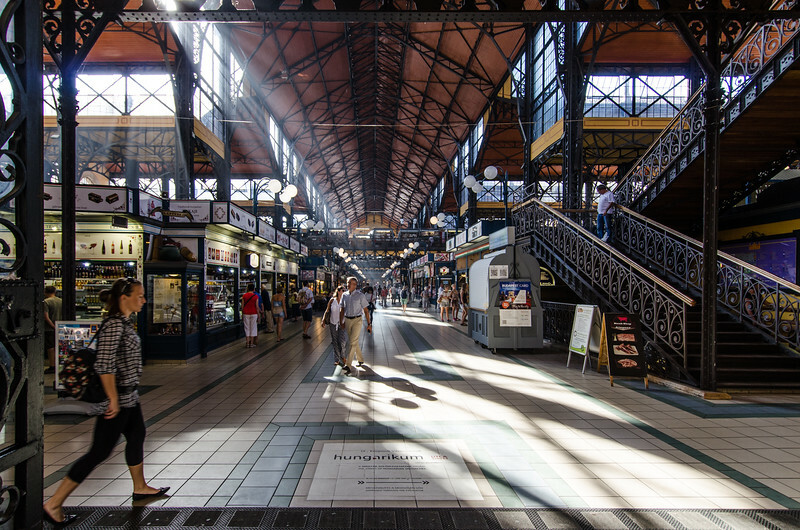 Fun fact: the Great Market Hall is three stories and arranged, as follows. Prepared food and souvenirs on the top floor, produce, meats, and raw foods on the ground floor, and the “stinky foods” (fish and pickles!) in the basement. 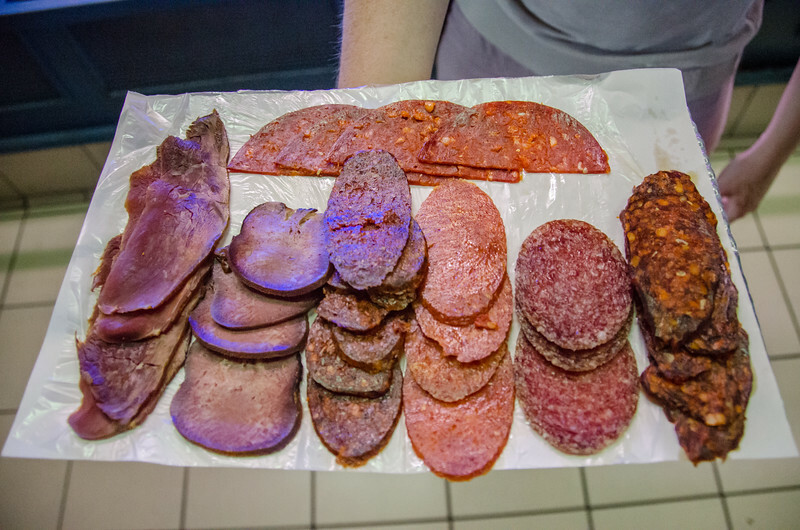 Meats: Our guide ordered us a selection of interesting cured meats including winter salami, a spicy salami, local mangalica pork (a furry Hungarian pig that looks like a sheep), cow tongue, venison sausage, cured horse (!) 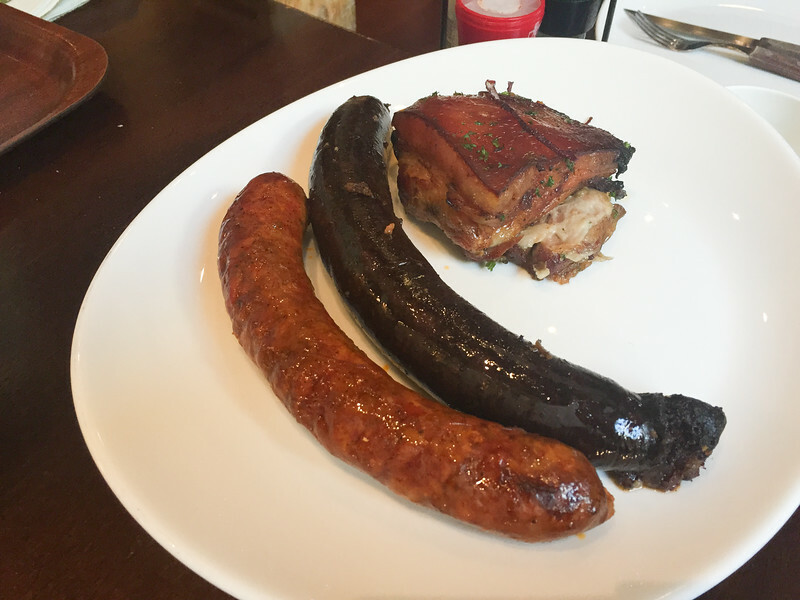 ham, and horse sausage. 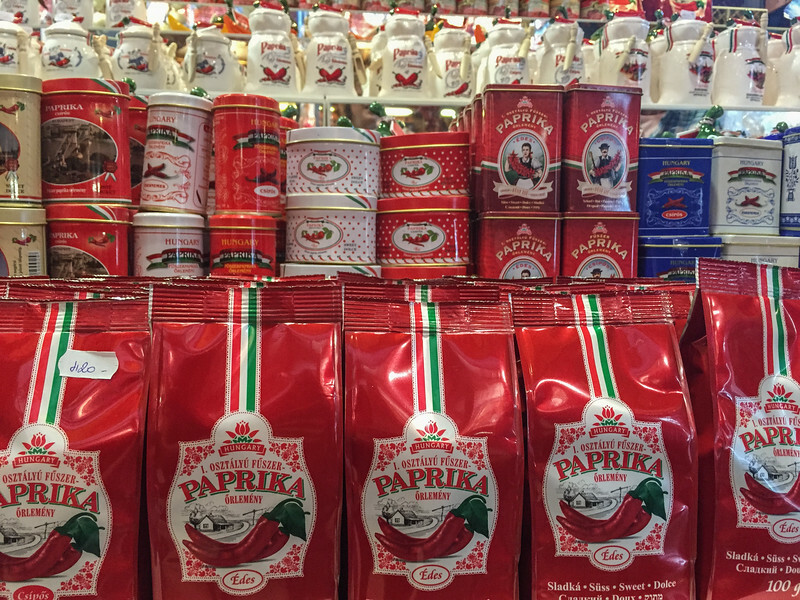 Paprika: There are many varieties of this popular Hungarian spice, from sweet to strong and even paprika paste sold in a jar. 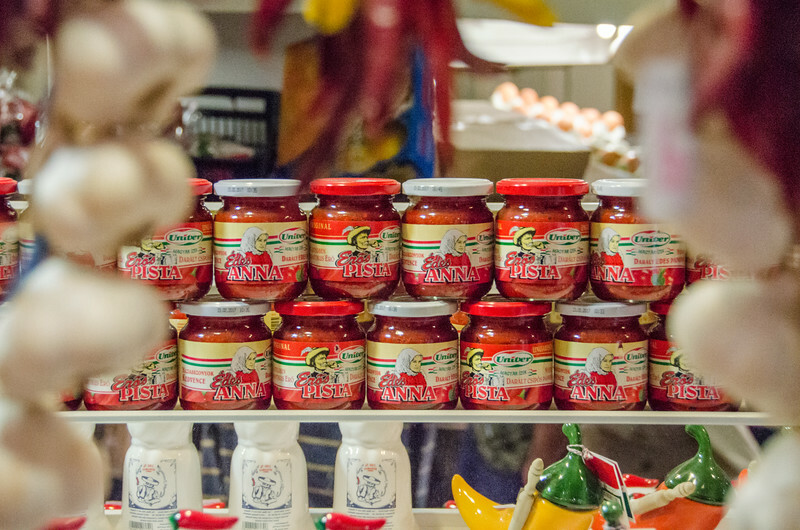 Our guide said that there are a lot of counterfeit paprika vendors who sell low-quality adulterated paprika in souvenir stores, so it’s best to buy paprika at a culinary market like this. Hungarian Wine: After the Central Market, we visited the Tasting Table, a wine shop and culinary event space owned by Taste Hungary. 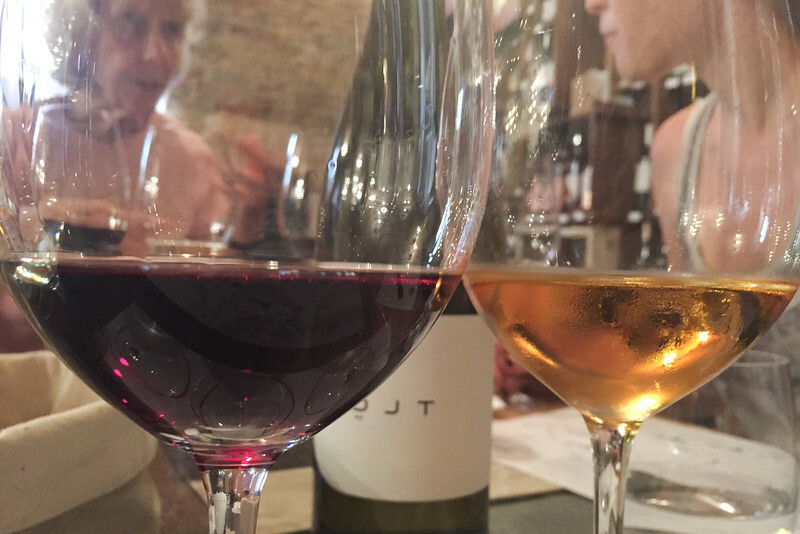 The guides are experts in the 22 wine regions in Hungary and know plenty of small Hungarian vintners that are worth trying. 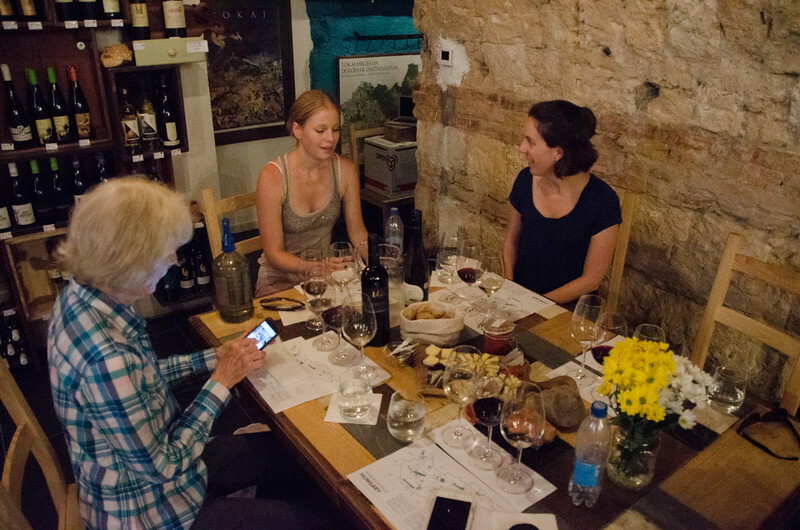 We sampled a variety of wines with local artisan cheese and sweets. 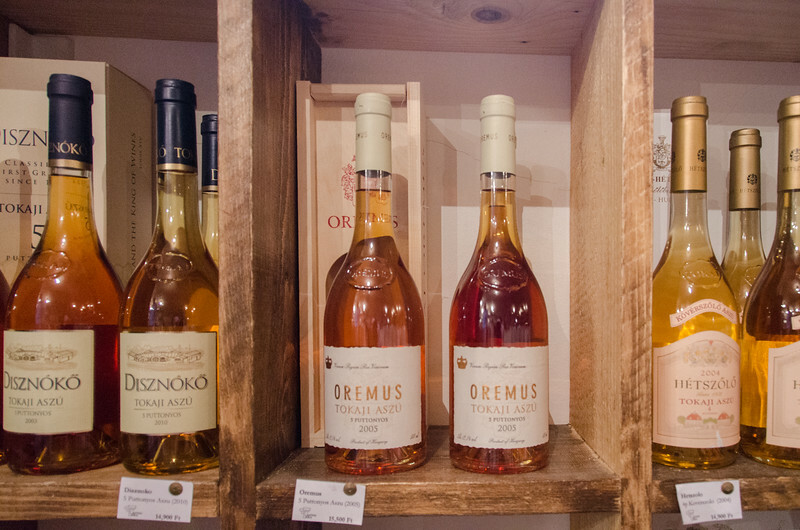 We loved the country’s famous tokaj wines. These grapes are harvested late and picked by hand. They dry a bit on the vine, and it concentrates the sweetness of the grapes. 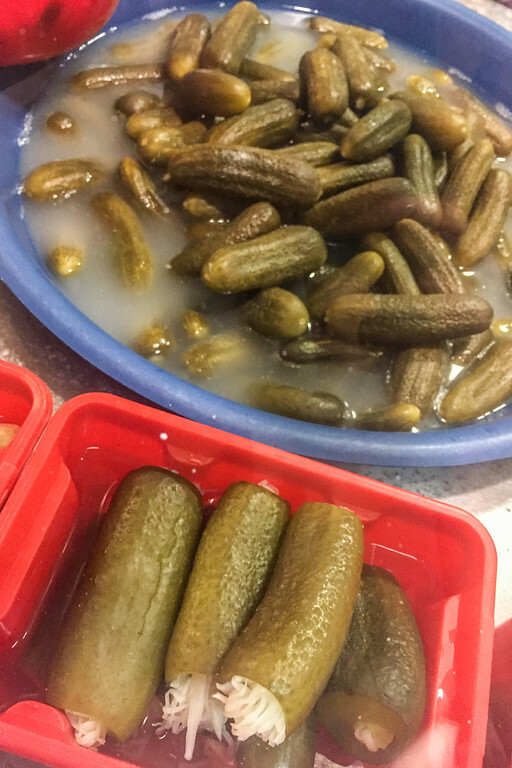 Belvarosi Disznotoros: We visited a popular deli at lunchtime to try a large selection of local favorites. 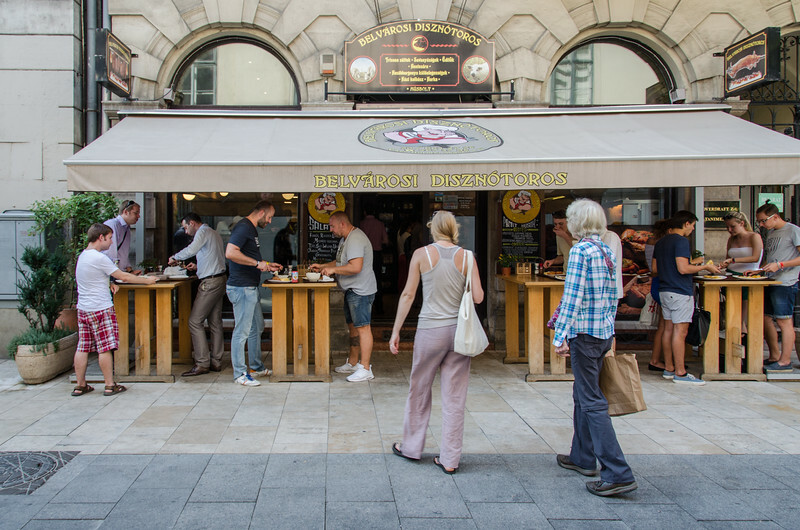 Coffee, cakes, and cafes: Budapest has a lot of lovely traditional cafes. 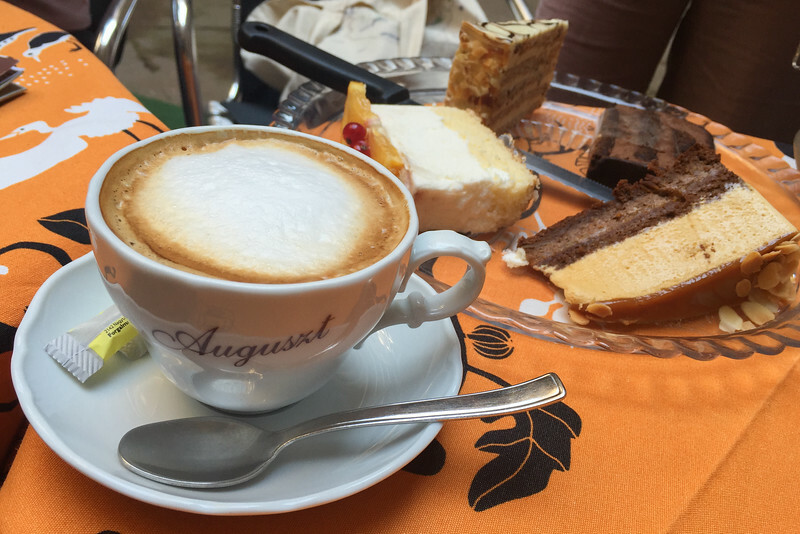 The city actually has an older coffee culture than Vienna or Paris. 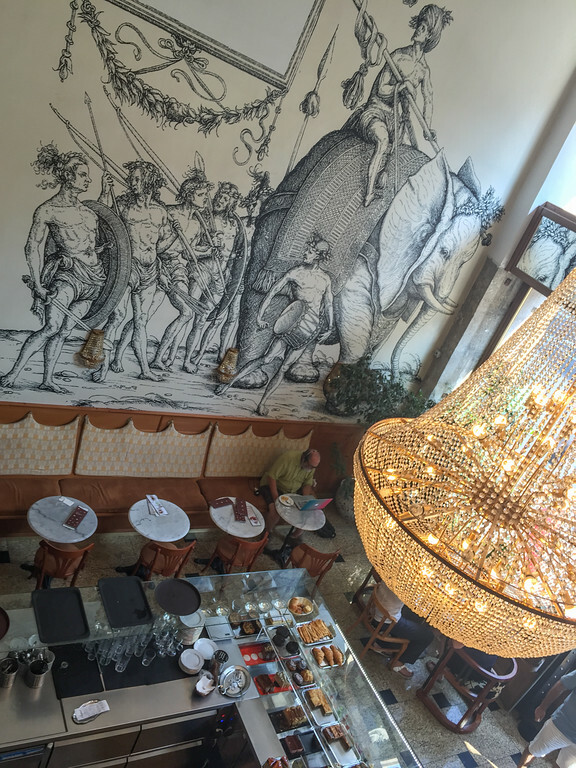 There are a few remaining art nouveau cafe, including one of the oldest, Cafe Auguszt, built in 1870. 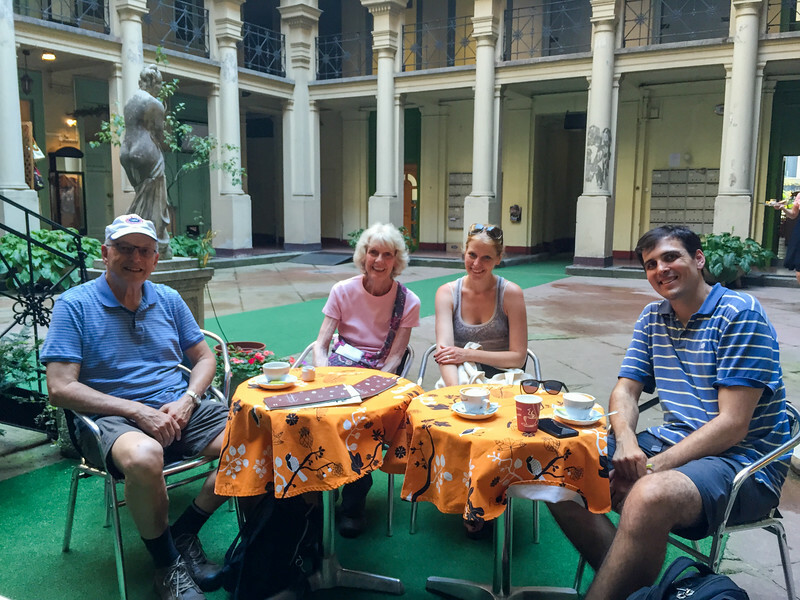 We sat in the building’s historic courtyard and ordered several types of sweet cakes served with espresso drinks. I was a guest of Taste Hungary for purposes of this review. All photos and opinions are my own. I wish I could go there just for this tour. 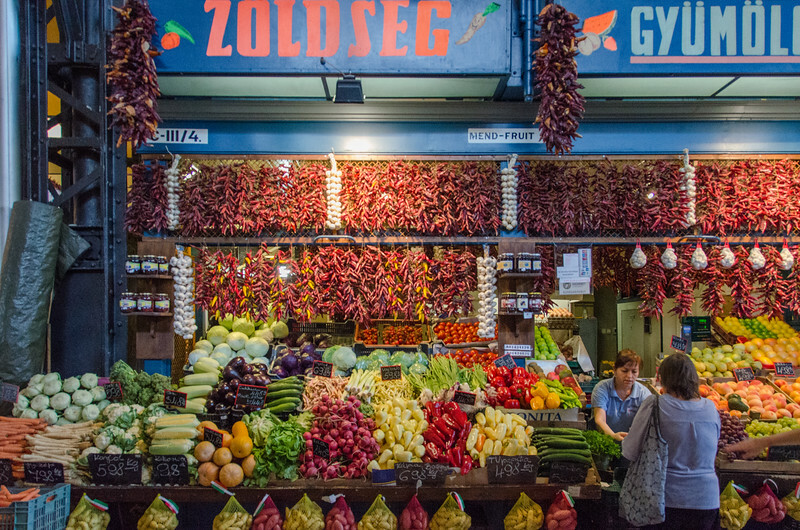 That food market in the first photos is gorgeous. I was in Budapest for a few days many years ago and would love to visit again. 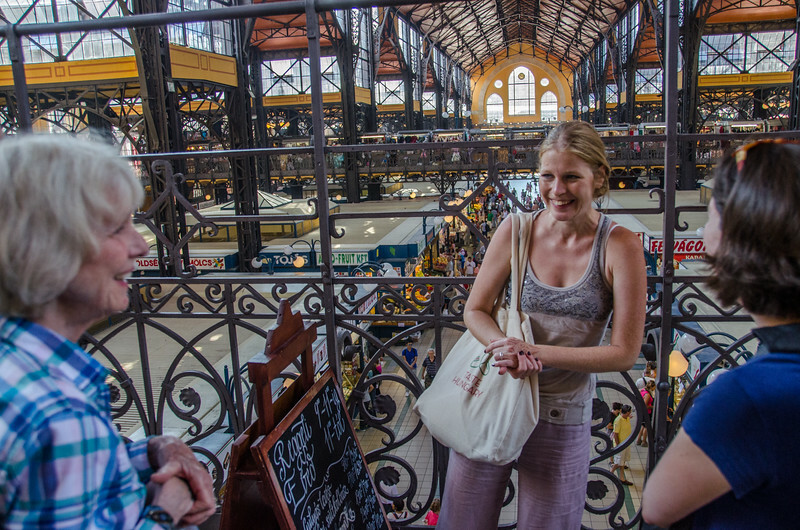 We loved Budapest especially the food markets. You forgot to mention that paprika comes in two forms edes (sweet) and csipos (hot). When one goes into a restaurant, the server brings bread and a dish of eros pista. My husband would slather the eros pista on his bread while I would spread a 1/16 tsp on mine! It is HOT!!! I loved their pickled vegetables, too. And, langos, I could eat langos every day! Wow, I wish I had done this tour on one of my trips to Budapest. I am bookmarking so I can include next time, thank you.